This project, coordinated by i.PEICC, allowed four youngsters to come to France for a voluntary service. The main objective of the project was to promote open-mindedness and sense of belonging to Europe in a rural area, Magalas, and in an urban area, Montpellier. The aim was to fight against racism and all kind of discriminations, by promoting the values of liberty, tolerance, diversity and respect of Human Rights. Two volunteers were directly hosted by i.PEICC : Carla, from Italy (sent by YouNet) and José Carlos, from Spain (sent by Mundus). During the month of October 2018, they supported i.PEICC team in various actions. Their main task was to help a youth worker in its actions towards children and youngsters in “bidonvilles” (= slums) in Montpellier. Among the activities that they prepared were for example swimming classes, visits to the zoo, various games… The aim of these activities was to help the children from Roma community to feel more integrated in the society. 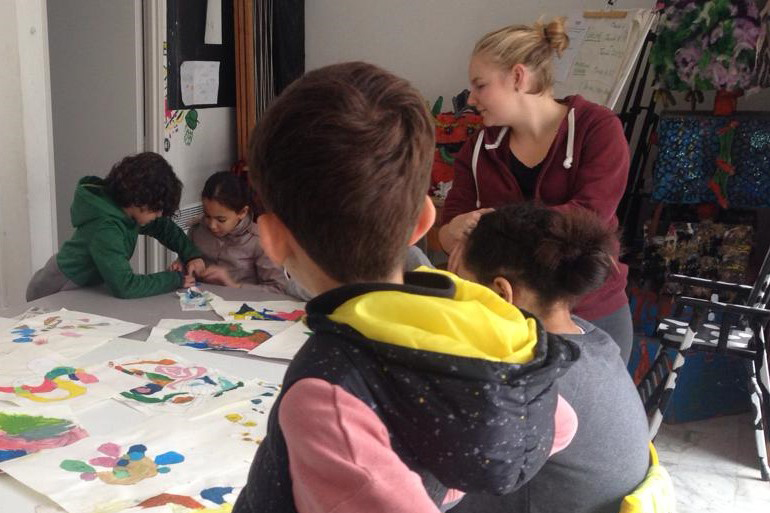 Each Wednesday morning, volunteers were also involved in the management of artistic workshops for children in the disadvantaged area of La Paillade. During their stay, Clara and José had the possibility to join a two-days workshop aiming to help youngsters to create pocket-films in order to participate in a contest! Two volunteers were hosted by the Community of Communes of Avant-Monts in October 2018, for a 10 months project: Maria Cristiana, from Romania, and Carla (who was sent by the Werkstattschule Heidelberg), from Germany. Their task was to create and implement workshops for children and youngsters, aged 3 to 20. Thanks to the workshops, the volunteers could discuss very various topics : Europe, culture, citizenship… Maria Cristiana and Carla’s role is also to inform youngsters about opportunities offered by the Erasmus+ program.